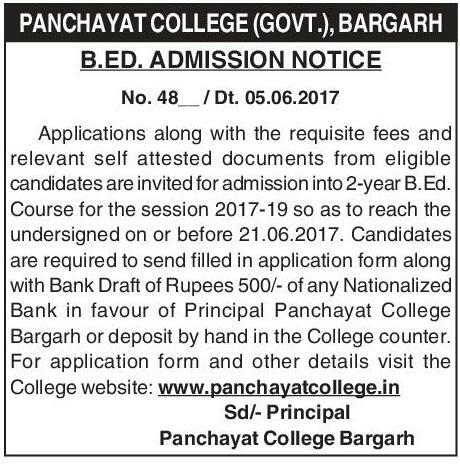 Panchayat College (Govt) Bargarh Odisha Published B.Ed Admission Notification for the Academic Year 2017-18. Now Interested Candidates Can Apply though Direct Contact with College. 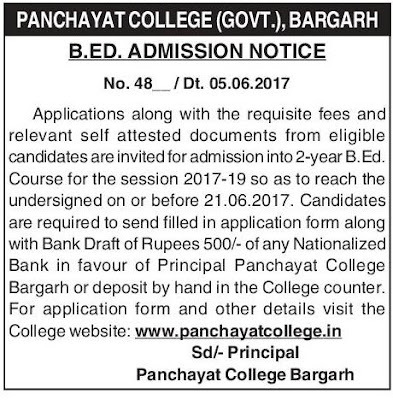 Panchayat College (Govt) Bargarh B.Ed Admission Notification 2017-18. Candidates Can Apply with Application Fee with the Requisite Fees and relevant Self Attested Documents. Eligibility- Candidates Must Have Passed Graduation Degree from Any Recognized University. Application Fee- Rs. 500/- Bank Draft of Any National Bank in Favour of Principal Panchayat College Bargarh.